I have just completed filing my first official IFR flight plan as an instrument-rated pilot. Those aviators who know me and know my addiction to aviation will know what that means. It means this is real now, the training is over. It is on me and not the CFI to keep myself and my passengers out of a future NTSB report. 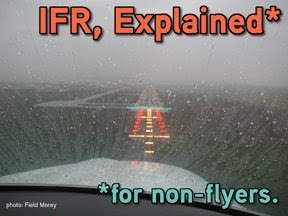 Pilots who read this blog already know about flying IFR in IMC. My instrument-rated brethren have been down this road, they have studied for the written, stressed over the oral, white-knuckled their way through the check ride, and now fly regularly "in the system" as we clagg-rated guys like to say. In our Federal airspace system, all aircraft generally share the same sky. The many shapes and sizes of flying machines are separated into two groups, those flying under "visual" flight rules (VFR), and those flying under "instrument" flight rules (IFR). The difference here is pretty obvious, a VFR pilot must maintain clear of clouds (the distance varies according to the type of airspace) so he/she can visually see other traffic. An IFR pilot can file an IFR flight plan, and then fly into the clouds completely by reference to the aircraft's instruments, so long as he/she flies an exact route as specified in the flight's "clearance" from ATC. It's that clearance that is the major difference between VFR and IFR. Away from the busier airspace that encircles large population centers (cities), you are pretty much allowed to go where you please, at any altitude you please while chasing down a $100 hamburger as a VFR flight. But as an IFR flight, ATC spells out in no uncertain terms what route and altitudes to fly. 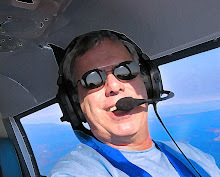 You are under "positive control" at all times, and if you let your pilotage get sloppy and drift off an airway, you can be sure to get a usually gentle nudge from ATC back to the centerline. All commercial airline flights are by regulation conducted as IFR flights. ATC wants to know exactly where each and every pressurized tube full of Grandmas is located, and where it's going. This is required to provide "separation services" so nobody trades paint. When an airliner is given an IFR clearance, in layman's terms, you can visualize that route as a tube going through the sky. Each IFR flight has its tube, and NATCA's controllers are tasked with seeing that no two tubes converge into a fireball. But when I fly Katy – our family/business Cherokee 235 – we also get assigned an identical tube to fly through when cleared IFR. With me so far? So as the Katyliner and an airliner are approaching a towered airport as IFR flights, we BOTH have identical priority. Since all IFR flights are sailing though these tubes that all end up at the runway threshold, it is the job of ATC to adjust the final approach courses to allow the traffic to smoothly flow back to the crust of this planet. As an IFR flight, I get to fly in the very same air as the guy flying the 'Big Iron', receiving the same separation. In a large metro area, this is a blessing, because ATC wants me where they want me, NOW. But as an VFR flight, I would be sent to the back of the line, served by ATC only after they are assured all IFR traffic is dealt with. Yes, this priority IFR treatment is what I worked so hard for. Of course, I have nothing at all against those who chose to fly VFR, it is still a very cool way to fly. 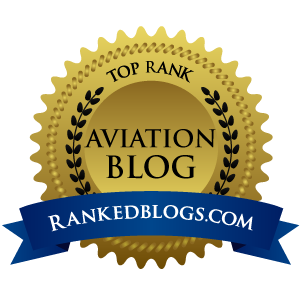 But as one pilot who always flew with flight following anyway, this rating will just take ATC services to the next level, caring for my flight wheels up to wheels down. I can now very easily fly right through the busiest of airspace, following ATC's instructions and flying a precision approach until I am right over the numbers. And when it's 200 and 1/2, having your windscreen filled with the touchdown zone when you pop out of the soup is a good thing.